Liver progenitor cells may play an important role in carcinogenesis in vivo and represent therefore useful cellular materials for in vitro studies. 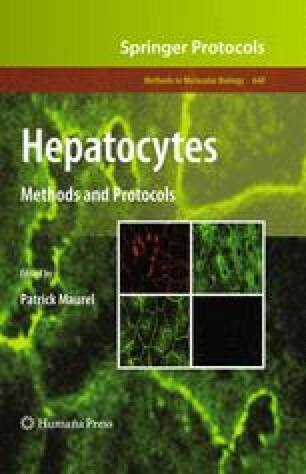 The HepaRG cell line, which is a human bipotent progenitor cell line capable to differentiate toward two different cell phenotypes (i.e., biliary-like and hepatocyte-like cells), has been established from a liver tumor associated with chronic hepatitis C. This cell line represents a valuable alternative to ex vivo cultivated primary human hepatocytes (PHH), as HepaRG cells share some features and properties with adult hepatocytes. The cell line is particularly useful to evaluate drugs and perform drug metabolism studies, as many detoxifying enzymes are expressed and functional. It is also an interesting tool to study some aspect of progenitor biology (e.g., differentiation process), carcinogenesis, and the infection by some pathogens for which the cell line is permissive (e.g., HBV infection). Overall, this chapter gives a concise overview of the biological properties and potential applications of this cell line.